Eliza has been fortunate enough to have a wealth of experience working and volunteering with children and youth. Eliza has worked in overnight camps, day camps, childcare centres, tutoring programs and drama programs, experiences which she uses to inform her present work as an Artist Educator. Eliza began working with children through UCC Theatre Arts Camps and through the YMCA. Eliza has lead and facilitated leadership courses, camp programming and outdoor education experiences. She has also led an after school care and tutoring program with a local school through the KWYMCA. Additionally, Eliza worked at KWYMCA Camp Belwood, going on to perform a supervisory role as the Program Director and Head Counsellor for two of her four years at the camp. In 2014, Eliza began to work for the YMCA in Toronto, as an ECA within the Childcare Centre of a TDSB Elementary School. Eliza worked for three years in the Early Learning Program (Kindergarten) and ran a drama enrichment program for the preschool classes. Eliza has volunteered and trained with companies such as Children's Arts Theatre School and Young People's Theatre, as well as attended YPT's Artist Educators Training in September 2017. 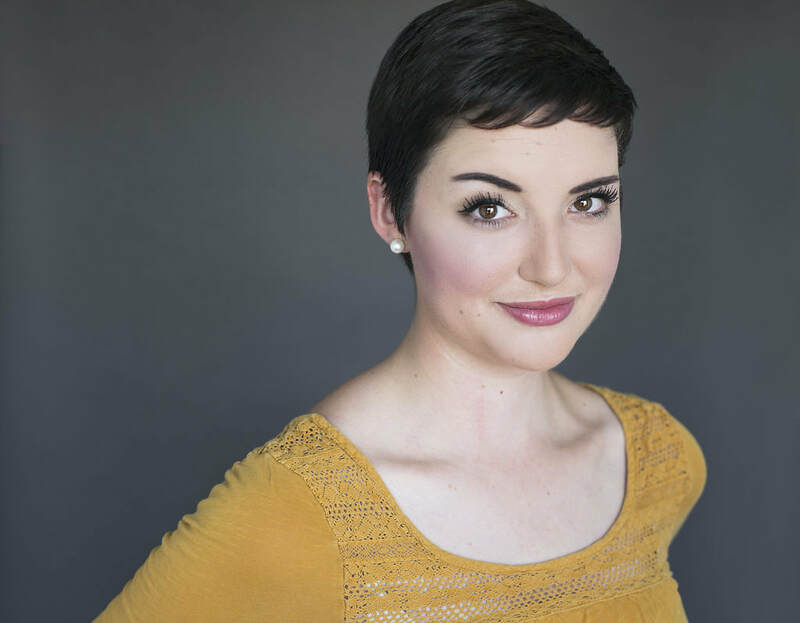 At present, Eliza continues to work in Early Childhood Education for the Y as well as teaches for Purple Carrots Drama Studio , Shakespeare in Action, and Children's Arts Theatre School. In 2017 Eliza launched her own initiative: Queen Bees Arts Education, which runs extra-curricular and co-curricular programming throughout the year, as well as a feminist-focused reading list for children: Honey in the Hive. Eliza has now begun writing about her teaching experience and many adventures in arts education on the Purple Carrots Drama Studio Blog - read and learn more! 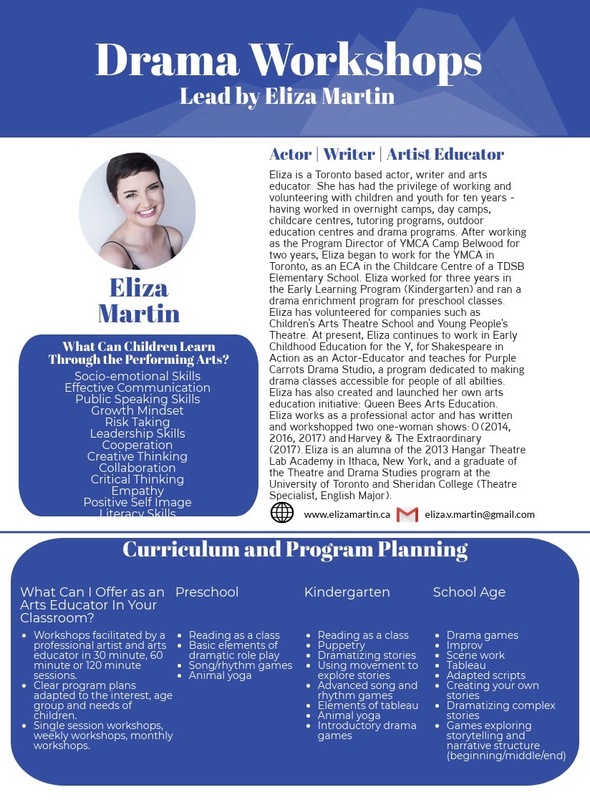 Eliza teaches and offers Drama workshops to interested schools and childcare programs. Are you interested in bringing an arts educator into your classroom? Learn more about the programming Eliza could offer as a freelance arts educator by downloading her curriculum handout here. Queen Bees Arts Education is a new arts education initiative created by Eliza Martin and co-founded by Cornelia Audrey and Olivia Orton. The goal of the program is fostering personal growth, creativity and self confidence in children, through dramatic art and storytelling. Queen Bees welcomes all, however focuses particularly on, and is designed for girls! Eliza is thrilled to have brought Queen Bees to life, knowing how impactful and transformative the performing arts can be. Eliza is finishing up teaching an eight week co-curricular partnership this fall while preparing for the Queen Bees Winter Course 2019. Registration is now open. Please visit the Queen Bees Arts Education website for more information. Purple Carrots Drama Studio offers inclusive drama classes specializing in varying abilities. Purple Carrots is a space for growth in connection and communication with self and other through drama. Combining elements of drama art, play therapy, speech therapy, improvisation, singing, dancing and music into theme-based workshops, Purple Carrots helps students with all abilities explore their full potential in a safe, supportive, and fun environment! Eliza presently leads classes at the Purple Carrots Etobicoke location. Visit their website to learn more about programs offered here. Shakespeare in Action is a diverse theatre company that aspires to enhance the arts and education through exploring and performing Shakespeare's plays. SiA is dedicated to fostering literacy, enhancing creativity and promoting speech arts by making the language and stories of Shakespeare accessible and relevant to young audiences, their families, and the community. Visit their website to learn more about programs offered here.